When working as an assistant for Max Dupain from 1948 to 1951 David Moore walked the depressed inner-city areas of Sydney after hours taking still photographs in the style of the documentary movement. The informal structure of 'Redfern interior' was taken when the young David Moore was mistaken for a press photographer and asked by a neighbour to take a photograph of the condemned house and the squalid conditions in which the family were living. The cramped space, despair and poverty passing through three generations to a newborn baby, has no joy and little hope for change. 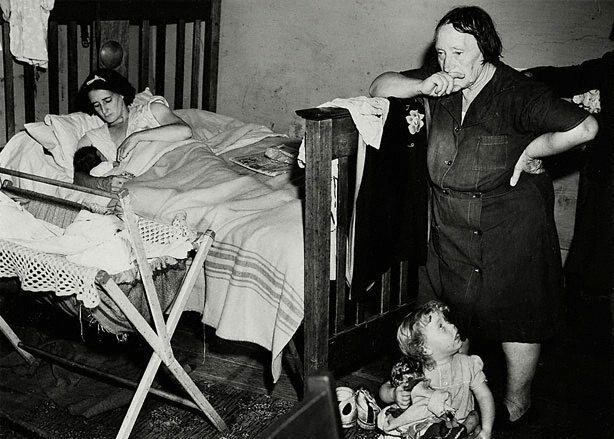 The monumental matriarch, leaning on the bed, withdraws connection from the family, seemingly self-absorbed as she contemplates the bleak environment. As the mother breastfeeds the women do not appear to be conscious of a young photographer in the room, probably doubtful he could make a difference. Each face carries equal weight, their despondency palpable. The image is roughly divided into white (the bed) and black (despair) which can be read as metaphorically representing life and death. Moore discussed destroying the negative with Dupain because, as he was not a press photographer, there was no possibility it could be published. Instead, and with a social conscience, Moore sent a copy on behalf of the tenants to the council responsible for eviction but received no reply. ‘Redfern interior’ was included in ‘The family of man’, the international exhibition assembled by Edward Steichen for the Museum of Modern Art, New York, in 1955, which arrived in Australia in 1959. Signed and dated l.c. verso board, pencil "...1949/ David Moore".